Amma replied, “Maya doesn’t mean ‘non-existent.’ Rather, it means, ‘ever-changing.’ For example, take a fully blossomed flower. You enjoy the colour and the fragrance of the flower. But by the evening, that same flower withers away — with that understanding you enjoy the flower. If you have that understanding that everything is changing, when the flower withers away you won’t cry. Maya doesn’t mean that flower never existed, but that it is in a constant state of change. “When we move through life with preconceived notions, we will experience sorrow. When we think, this person will love me, that person will give this or that to me — that expectation creates sorrow. If we depend on that which is changing, sorrow will be the result. This is the true definition of Maya. “If you are loving something which is not present in people, then you will experience sorrow. That is Maya. At present we do not have the capacity to really love other human beings because of our ego. We are using them. We want them to be tuned to ourselves, but we will not tune ourselves to others. Thus the ego and the attitude of ‘I’ blocks the flow of real love. That’s why we love cats and dogs so much — they tune to our wishes, they obey our commands. That ego is the foundation of Maya. “We go through life believing that happiness can be found in other people, can be found outside ourselves. That is why we are not able to cross over this Maya. A marriage becomes like two beggars begging from one another. Both are expecting to receive from the other, while no one is there to give. And yet if no one is there to give love, how will you receive love? It can also be compared to two blind people, each trying to lead the way for the other; they will stumble here and there, reaching nowhere. “Our love always comes with an expectation. We may love race horses so much, but if the horse has an accident and breaks its leg, people may even end up shooting that horse which we loved so much. We may love cows because they give milk, but once it stops giving milk, we won’t mind giving it to a butcher. That is the nature of the worldly love. “A stray dog may chew a bone so much that its gums start to bleed. The dog enjoys the blood, thinking that it is coming from the bone. Finally, the dog loses consciousness due to loss of blood. Similarly, we think that we are finding bliss from the objects of the senses, but if we look closer we will find that the source of bliss is always and only within ourselves. We are thinking that the source of bliss is other people or objects outside us. That is why we are not able to overcome Maya. “We are depending on others for love and happiness. we are depending on something which does not exist. So we are expecting something which is not there. We should awaken within. Instead of seeking we should be giving. “We should try to see everything in its place then sorrow will cease. For example, we should see an elephant as an elephant and a frog as a frog. We should see a nurse as a nurse and a doctor as a doctor. We should not expect the nurse to behave like a doctor or expect the doctor to behave like a nurse. We should not expect a dog to behave like a cat or vice versa. Both sugar and salt are white, and yet we do not expect sugar to taste like salt and vice versa. “For example, let’s say that you need to borrow some money, so you approach a childhood friend and ask to borrow Rs. 1,000. This friend had earlier told you, ‘Come to me anytime you need anything. I am so wealthy – I can help you in your time of need.’ Now, when you approach him, the truth may be different. He may tell you, ‘In fact, I wanted to come see you. I myself need some money urgently. Can you give me Rs. 10,000?’ Or he may say that he can loan you money, but he can only afford to loan you half of what you asked for. He might even offer you much more than you asked for – say Rs. 5,000. “Expectation is what brings sorrow. When we don’t get what we expected to receive, we feel sad. This sadness gives way to anger, which leads finally to depression. But it all starts with expectation. Instead of receiving, start thinking about giving. Don’t search for happiness outside yourself. There is an inexhaustible resource of happiness within. We are not candles lit by others, but the self-effulgent sun. We are not crying kittens, but lions who can roar if they so choose. 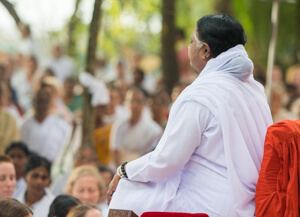 Question: Amma, how can I have self-discipline without being too hard on myself? Amma: Daughter, if you have the desire to build a house, what will you do? You will think about how you want it to look, you will sit with the architect, do all the planning and build it. Won’t you? It’s no different when you have the desire to know the Self. When the desire to know the Self arises, you will start doing all the things that are required to attain that goal and start avoiding all the things that will take you away from it. The more love you develop for the goal and the more you understand the need for the various disciplines and spiritual practices, the easier it will be to adhere to those disciplines and practices. The love for the goal is like the petrol in your tank. It is what gives enthusiasm, energy and vitality in your practices. Sometimes when the mother or father needs to do some work, they cannot keep their eye completely on their child. So, then, they may give him some crayons or some toys. This way the child can continue to play but the mother knows where he is and what he is doing. The mother knows the child is safe. Similarly, it is the mind’s nature to be active. The point of doing spiritual practices is not to limit our freedom, but to give the mind an activity that helps it and protects it. When we fly, the stewardess will make us wear our seatbelt. She has nothing to gain by that. She is not doing it to torture us. She is doing it for our safety and protection. Similarly, at first, adhering to spiritual disciplines may seem to take away our freedom, but really it is taking us to freedom—true freedom. When we study the scriptures, we will develop the right attitude towards such disciplines. We will understand the need for them in order to attain our goal. We will understand that they are not for God’s benefit or the guru’s benefit, but for our benefit. The more we understand the benefit derived from them, the more inspiration and enthusiasm we will have to do them. In order to make sure they are adequately prepared for their exams, many students will make a timetable. It is helpful for spiritual aspirants to do the same thing. You have a goal – to know your True Self. You know certain things need to be done in order to attain that goal. How much spiritual practices you do and how strict you are in doing them—that is your choice. But once you have decided what you want to do, making a timetable and adhering to it as much as possible is a practical way to help you achieve your goal. If you really have real control over your mind—the same level of control you have to the television when you have the remote control in your hand—then there is no need to do any spiritual practices. But most of our minds are not like this. They are more like old cars; there is a big gap between the time we hit the brakes and when we actually stop. In fact, we usually stop only after we’ve had an accident. We may want to show someone love, but we are not able to do so. Don’t feel sad that you cannot be as disciplined as you would like to be. Do what you can. Don’t be sad about what you are not able to do. Don’t push yourself too hard. Don’t suppress or judge yourself. Give the body the food and sleep it needs. There is nothing wrong in that. But don’t overly pamper yourself either. There may be lapses in your discipline. We may fall down. But we shouldn’t allow it to make us feel frustrated. When you fall down, instead of lying there on the ground thinking how comfortable it is, remind yourself of your goal. Get back up and keep moving forward. Never accept defeat. 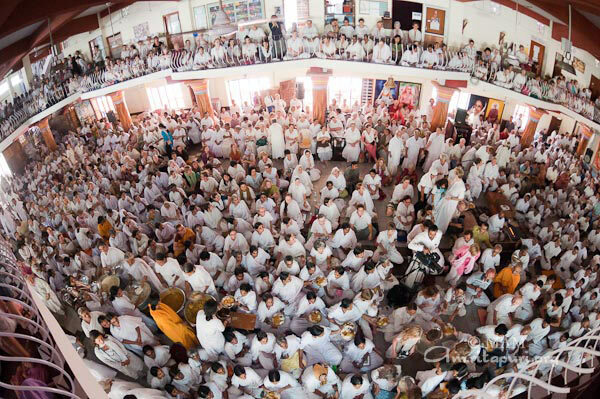 Every year before the USA yatra, Amma holds a meeting for all the ashramites. This is the time of the year when she shares her vision on the working of the institutions, point out shortcomings, suggesting the modus operandi we need to pursue and tips on sadhana. This year also was not different. The bell rang three times. Every one ran to the Kali temple. Within few miniutes Amma arrived through the balcony. She took the mic “All those who are looking after institutions, schools please stand up.” Scanning over the assembled, she said “Where are the others? Not all are here – I am going to mark them absent.” She sounded like a strict teacher. She continued asking for the requirements concerning schools/institutions for the coming academic year. “You have to give me proper lists of requirements – with exact numbers of where you need it and its justfication. Even if you give me a list, I won’t give you straight away what you ask for. It has to be a clear detailed list. Otherwise if you are given without any proper justification, then there might not be proper accountability. You might waste and misuse. And you will come up with the same list again next year” said Amma with a smile. She was pointing out our need for awareness. “You should make enquiries about such things in other institutions also. What sort of user – computer ratios do they have? Teachers are supposed to be aware of and be thorough with what they are teaching. They should not have to rely only on computers.” Amma cautioned. “You are all spiritual aspirants. We should have awareness in all that we do. Only then does karma become karma yoga. Strive to seek that awareness from me.” Amma started explaining about the subtle principles of spiritual life and its application. “Discipline helps good thoughts and qualities to develop, which in turn leads to Shraddha or awareness in action. For one who has Shraddha, everything becomes Puja (worship). Nothing will be wasted, everything will be practical” Amma said. Amma then started explaing how daily discipline can help us in our life quoting from her own life experiences. “During Archana, you can either chant or keep silence and imagine that you are doing an abhisheka2 with flowers to God, flowing from head to feet – that way you will be able to visualise the whole form. Archana – can be chanted together but should be in synchrony – with the same speed and shruthi3.” Amma pointed out. “Make a resolve; That we should reach a particular place by a particular time. It is only then that we will have the urgency to reach our destination. We should have the yearning and the Jijnasa- the desire to know” Amma inspired everyone. Narrating the story of Kaikeyi and Manthara from Ramayana, “If within the mind, some gossip and slander finds root, God leaves, Devil will rule the mind.” Amma warned. Amma was putting across the highest principles of spirituality and its practical execution in simple words. “We can serve everybody seeing God in all. That is Sanatana Dharma.” Amma concluded. 1 – Hari Nama Kirtanam, Ezhuthachan’s poetic composition of vedantic principles which people used to chant everyday as a prayer. Consisting 66 stanzas, each stanza starts in a descending alphabetic order with a malayalam character. 2 – Abhisheka, also called Abhishekam, is the prayer ritual where one pours libations on the form of the deity being worshipped, amidst the chanting of mantras. Amma indicated the mental action of throwing a flower in prayerful obeisance with the flower falling from head to foot, so one can visualize the form. 3. Sruti commonly refers to musical pitch. 4. 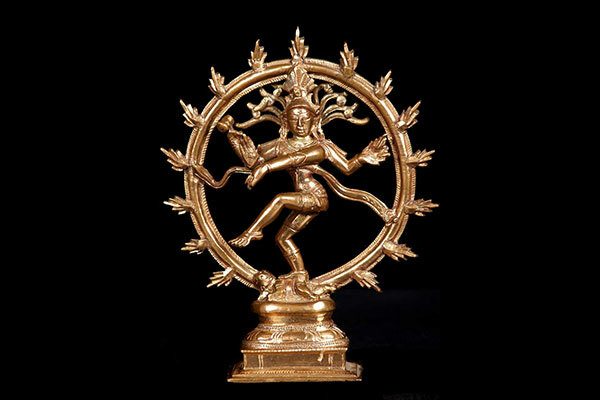 ‘Ishta Devata’ refers to one’s favourite form of worship. 5. 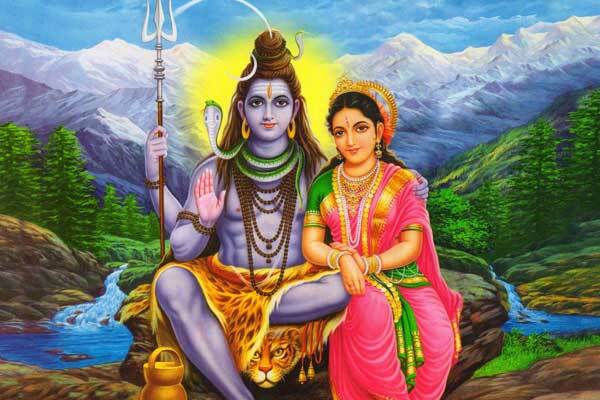 Saranagati – Complete surrender. Amma’s walk to the beach is a welcome sign for many ashramites and visitors. Sad faces blossom into smiles, surprised looks turn into glee. Such is the presence of Amma. The very evening becomes a festival. Last Monday evening the bell rang at 5 p.m. and Amma walked from her room to the beach. People love to crowd behind her and walk at her side hoping to catch her glance. Amma takes a loving look at them too. It was a beautiful sight. Amma sat down below a coconut tree facing the sea and with Swamiji translating, Amma lead the meditation for all who had assembled around her. After the guided meditation, Amma asked the question “What do you think about the practicality of spiritual practices?” Amma had been very keen to stress the importance of spiritual practices during her recent meditation-Satsang sessions. Many devotees chose to answer and one by one Amma would listen to them all while looking at each and all around her. After a few others expressed their views, an eight year old girl said “Everything is in God’s hands. We have to become instruments in God’s hands. 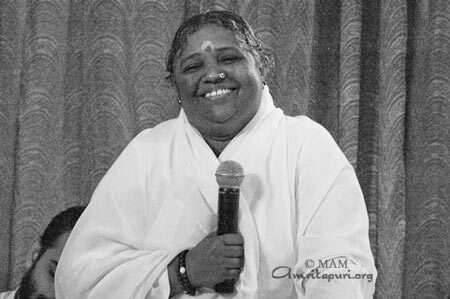 The world is so full of desires and there is no use going behind it.” Amma listened to the girl and pulled her closer and after looking at her deeply, hugged her with the fond affection like that of a proud mother and gently pressed her head tilted sideways against the little girl’s. Meanwhile a little Finnish toddler, Amritavarshini, who is less than a year old, helped herself to Amma’s seat and Amma took her up and set her on the extra space near her. The little toddler took some flowers and started giving them to Amma. Amma would receive it gently and would lovingly put it back on the toddler’s head. This went on for few many minutes as people spoke. The toddler then took out a beautiful picture of Goddess Kali and gave it to Amma. Amma received it and having blessed it gave it back to the toddler. The little one started offering the flowers like during archana to that Kali picture after having placed the picture resting on Amma’s seat. Amma smiled lovingly and the little girl turned her cheeks upward to Amma. Amma kissed her and then as she continued drew a small art representing a leaf on the cheek of the little toddler. The little one immediately turned around and wearing a proud beautiful smile showed it to all around her. 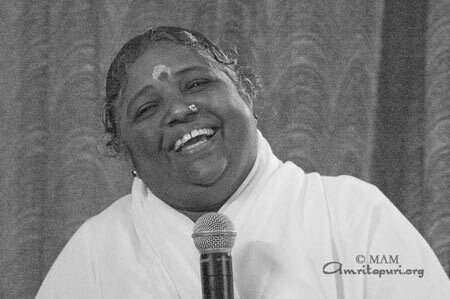 Laughing, Amma answered her saying that “when one has an examination at school, it becomes necessary to get up early in the morning to prepare oneself. Spiritual practices are similar. At present, our mind is not in our hands. Desires take shape in the mind. One needs constant practice to understand the nature of the mind. 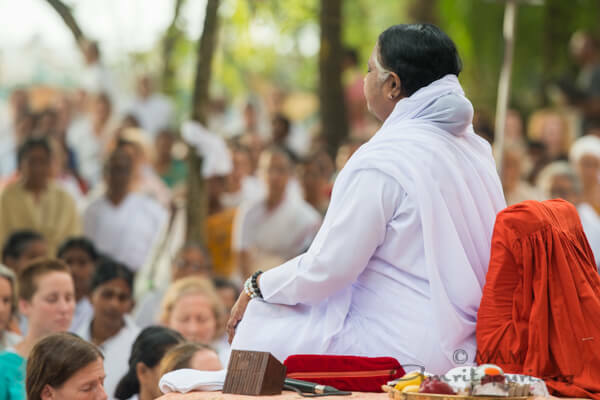 Such preparation alone will help our mind to keep it ‘air-conditioned’; when facing joy or sorrow, one must not get over-excited or over-depressed.” Amma explained about the practicality of spiritual practices. Amma continued her explanation saying, “Like the tortoise that can withdraw its head and arms into the shell when not needed, the mind should be withdrawn when not needed or in danger.” Amma went on to give another example, that of a tadpole and a frog. When the tadpole has a tail, it remains only in water. Once it transforms into a frog by losing its tail, it can go on water and on land as well. By losing our ego, one can live anywhere happily. Everyone is the One Self. Love everyone and serve everyone. ” Amma re-iterated the goal and the purpose of spiritual life. Amma’s ever smiling face carried with it the depth of wisdom of the Vedas. And then Amma referred to the story of a person who fell into a rapidly rushing river. Amma explained that by constant practice at least one does not fall backward, even if one does not go forward. “If someone has a business loss, one can recover, but time lost is a loss forever. Youth will not come back, childhood will not come back. So one has to create that awareness and put forth effort continuously,” Amma alerted every one. After singing ‘Mukundamurari gopala’ and walking back to the ashram to join the evening bhajans, many ashramites and guests were thinking how lucky they were to have Amma with them to hold their hand and walk beside them, instilling love and faith with every faith-filled step. Amma had been giving darshan in North America for two months. Regardless, the day after her return to Amritapuri, she promptly came to the temple to give her first meditation and question-and-answer session with the ashram residents. When Amma is in Amritapuri, the brahmacharins and householder devotees who live here can easily come to her for answers to their questions and to have any doubts cleared. But with Amma travelling more than six months out of the year, there are many times when one has to wait until Amma’s return to ask something. This was the case for one American woman living in Amritapuri. Her question was waiting on Amma’s peetham when Amma entered the temple. Amma told the woman that such experiences arise out of innocence. And that although one can take encouragement from such experiences, that they should not be given much importance. Amma said that all experiences are at the level of the mind and that the goal of spiritual life is to go beyond the mind. She said ultimately such experiences are much like dreams and, as such, they should only be given the same importance as a dream. Amma then said that charging money for teaching meditation, etc. is like a mother asking her child for payment for breast milk. Amma said, in fact, liberation is not something one can be given; it must come from within: “If the ancient sages had to do austerities for ages in order to realize that state, how then could one get it just by paying someone some money?” Amma derided. Once again stressing how the balance of mind during all experiences is much more important than what the mind actually experiences, Amma quoted the Gita “samatvam yoga ucyate” * “Maintaining equanimity of mind in all situations should be our focus. It verily is the goal,” Amma said. In response to the part of the woman’s question regarding people falling from the spiritual path, Amma said that the most important thing to do if one falls is to get back up and continue on. “There are many, many trees, and there can be many, many flowers on a tree. But not all the flowers become fruits. Some may fall away, others may wither, some may be eaten by insects. Along the spiritual path, there may be many falls, but if one does fall, the important thing is to not remain there, lying on the ground, enjoying the situation. You must get up and put in effort to walk further. Whatever effort you put in on this path will never be lost. You always have it with you. To realize our oneness with God may take our entire lifetime—it may take several lifetimes. You have to put in continuous effort. There is no other way. Everyone has to walk this one path. If you come upon an obstacle, you have to surmount it. 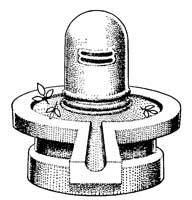 “The Vedic rituals, and the mantras which form a part of them, purify the atmosphere and benefit mankind. Of course they do much good, but they can’t be compared to the immeasurable benefit humanity receives from a person who has attained realisation. No matter how important and valuable the rituals are, the practitioner should strive to go beyond them and to experience the ultimate Truth within. That is the very purpose of religion: to realise that there is no god or goddess existing separately from our own innermost Self.